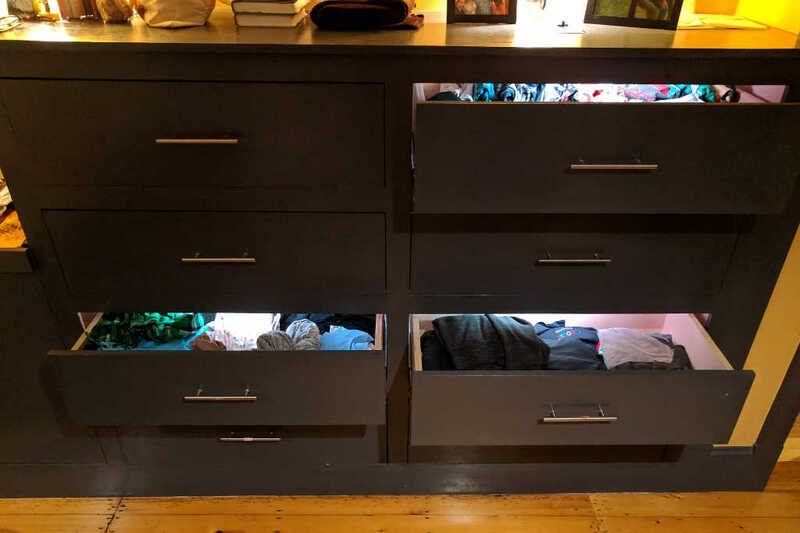 LED lighting for dresser drawers, with brightness and hue response to ambient light, and per-drawer switching. 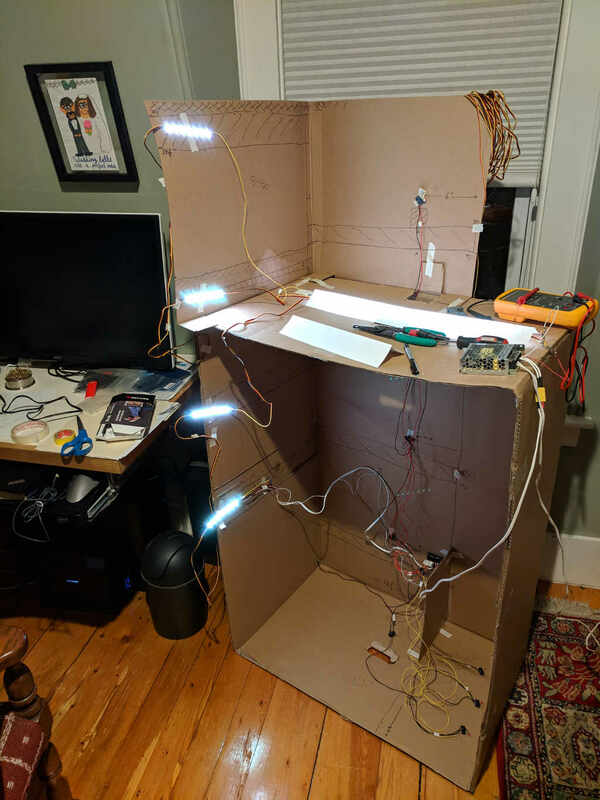 I started with a full-scale cardboard mockup of the inside of the dresser, so I could leave the drawers in the dresser while I measured wires and tested the implementation. I soldered male header pins on the control board so that I could easily plug servo connectors onto them for the peripherals: switches, ambient light sensor, and LED data. I used finishing nails to attach the switches to small wood blocks (the switches have two convenient mounting holes). 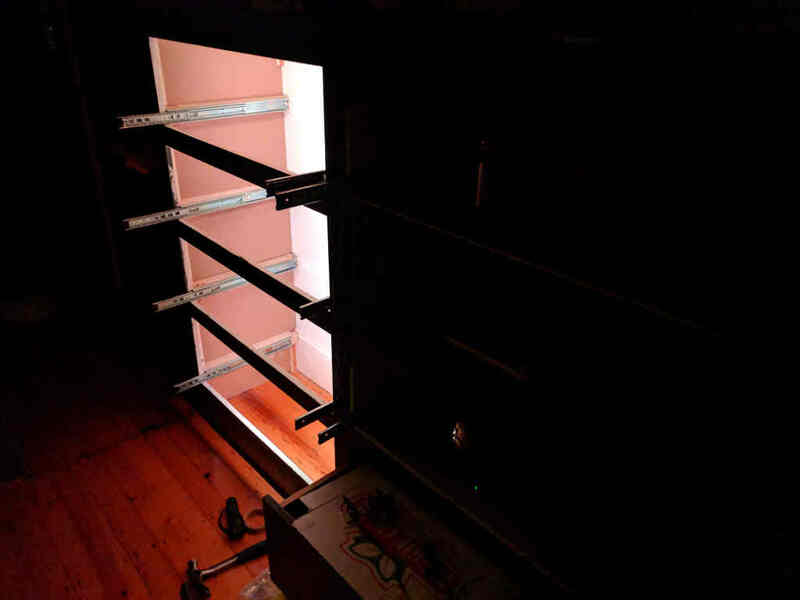 I ended up using a staple gun to secure both lamp wire and servo wires. 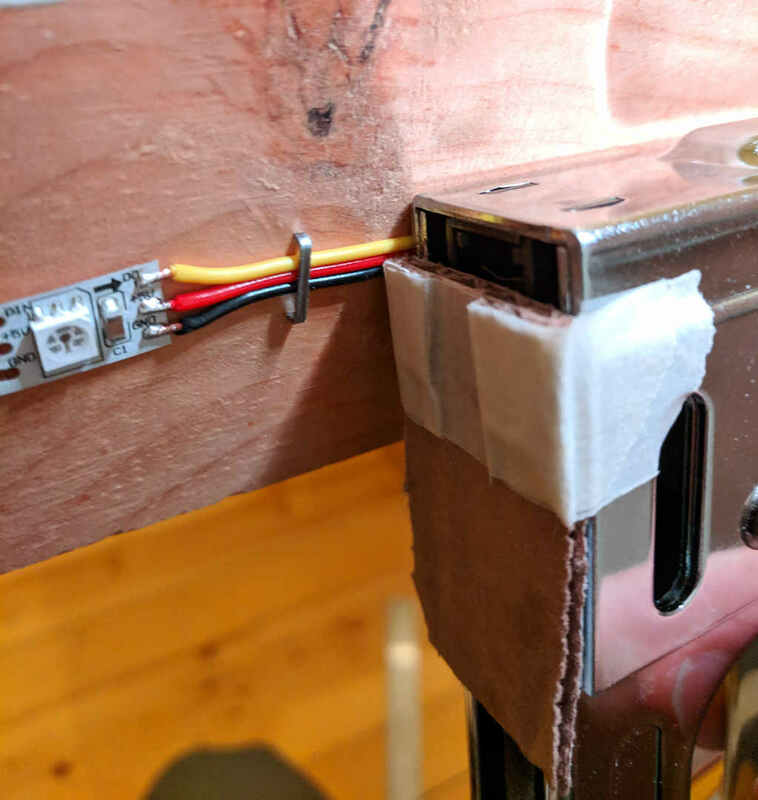 To avoid crushing the insulation (especially on the servo wire), I made a cardboard shim and guide for the nose of the staple gun. 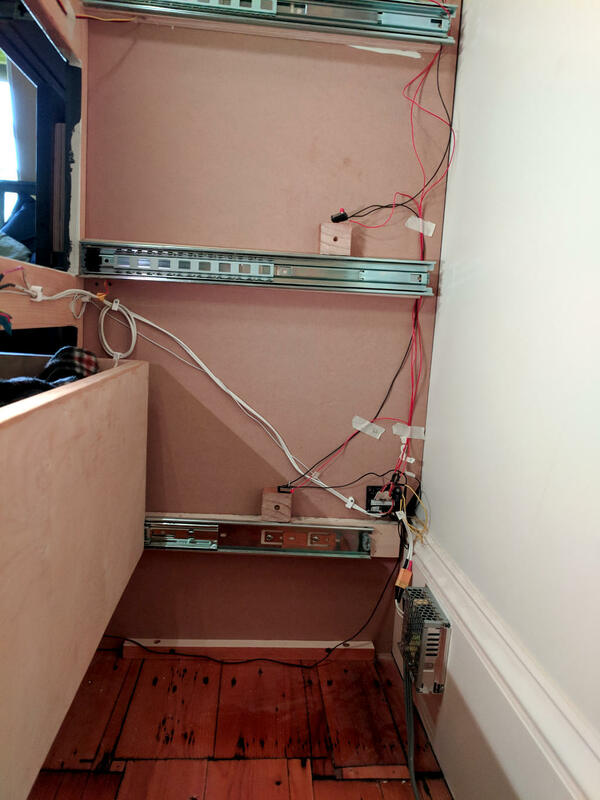 I drilled vertical holes through the blocking to which the drawer slides are mounted, so I could route wires up from one drawer to the next without going all the way back to the wall (where there was a gap). I used a right-angle drill bit adapter and a 1/2" drill bit. 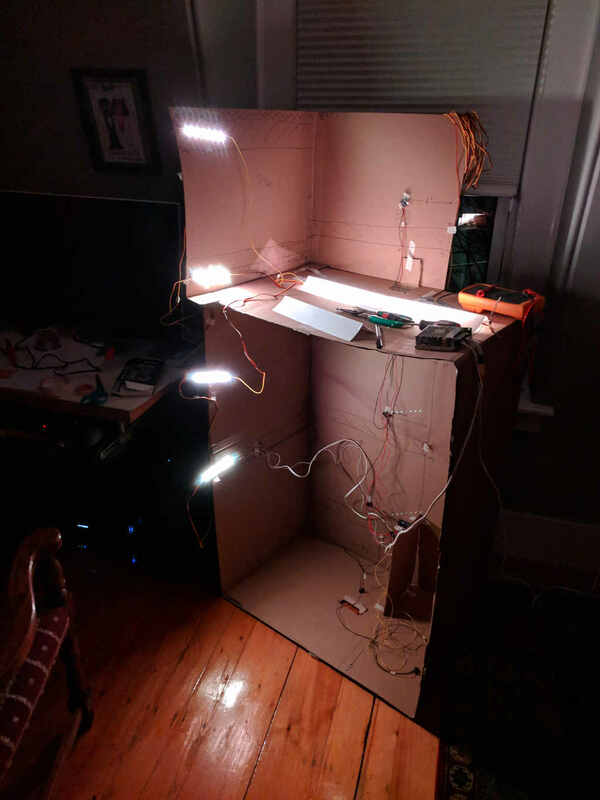 Arduino sketch source on Github. 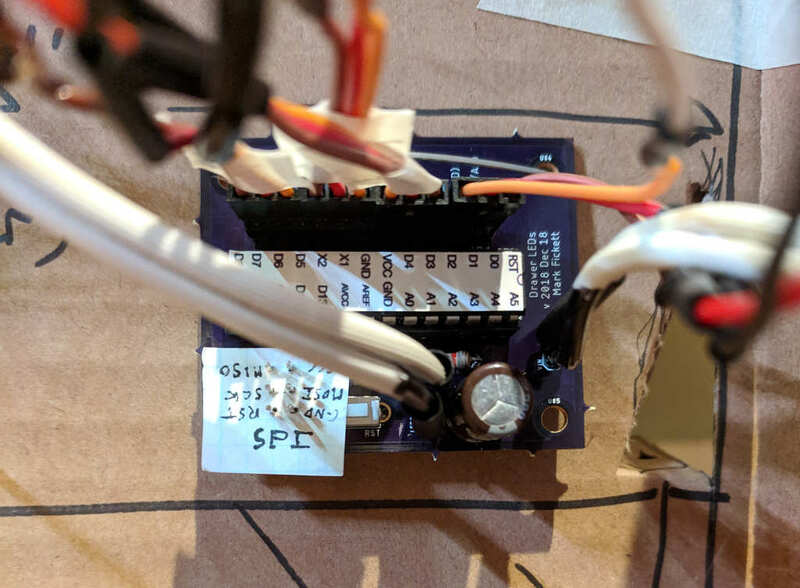 The circuit has switches as inputs to detect when the drawers are opened, a voltage divider with the photoresistor to detect ambient light, a digital output to drive the NeoPixels, and then some standard trimmings (filter capacitor on the power supply, reset switch, SPI header). I used the free version of EAGLE (see files in the `eagle/` subdirectory), and used its autorouting on the PCB. Although there's a resistor at the control-board end of the data line to the NeoPixels, after burning out one pixel, I also added a resistor at the LED-end of that wire too (as recommended). 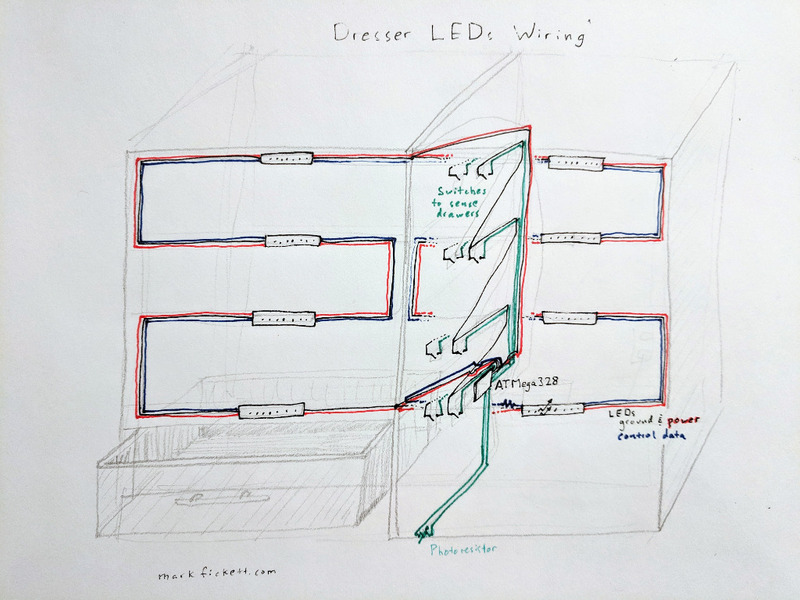 I used servo wire to connect data and 5V between the sections of LED strip. The servo wire is 22AWG, which is rated to carry 0.92A max and 16 ohms/ft. I used lamp wire to feed power to the ends and center of the LEDs. The lamp wire is 18AWG, which is rated 2.3A max / 6 ohms/ft. Until I added the center supply, I observed flaky data transmission in the middle of the LEDs. 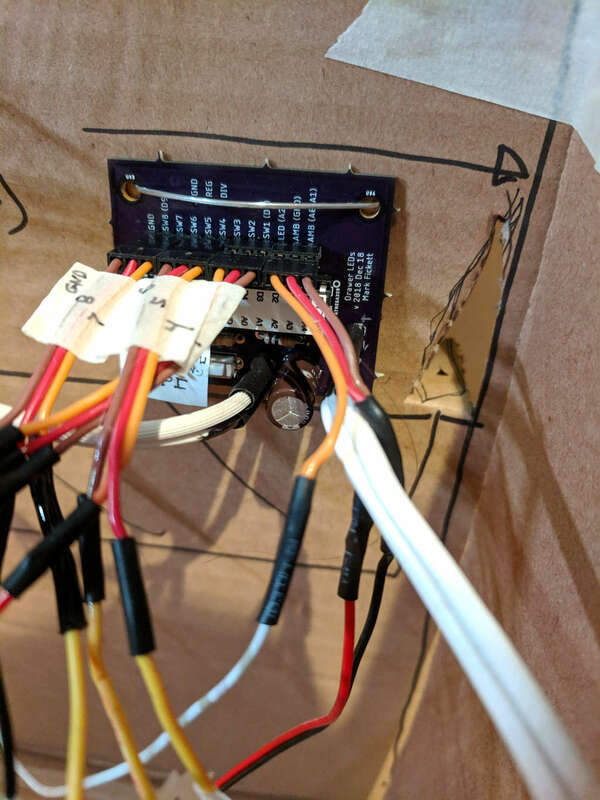 I also used servo wire to connect ground and a digital input to each switch. 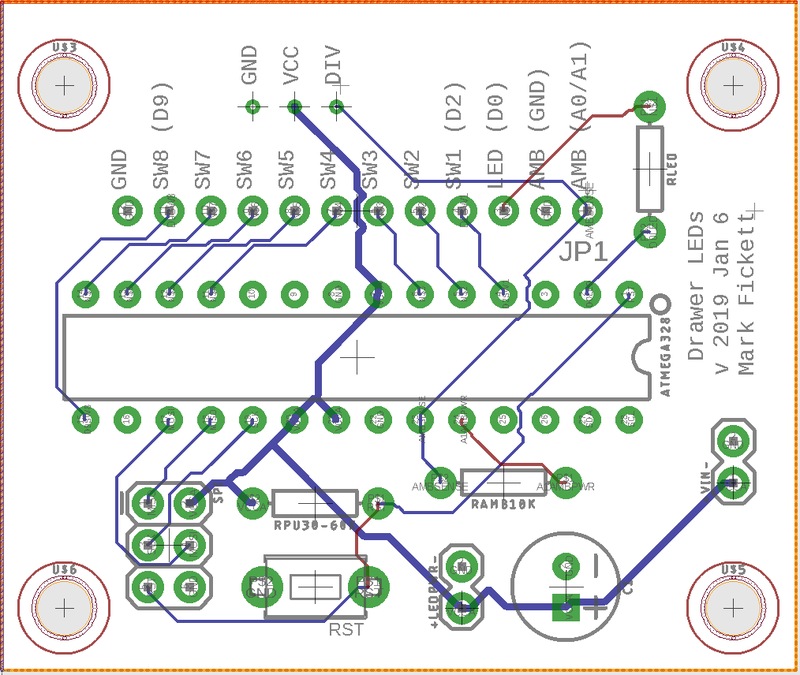 The 60-LED/m NeoPixel strip specification says 3.5A/m at 5V. 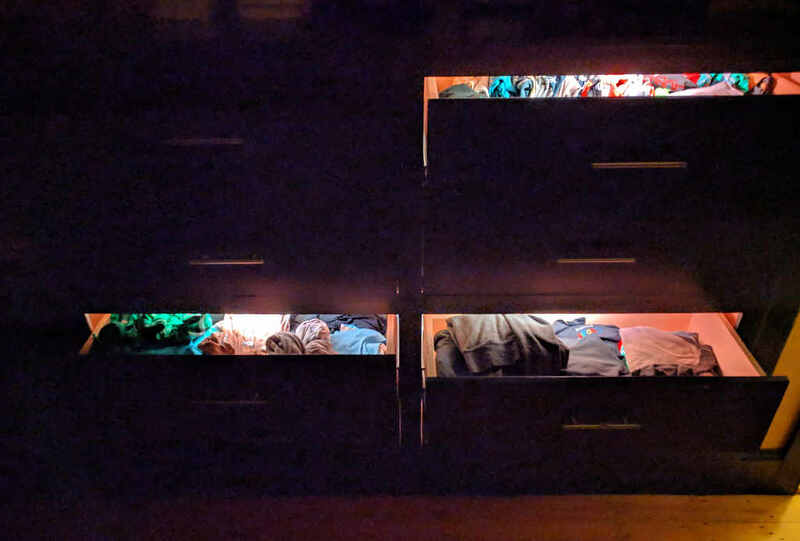 This setup uses 7 LEDs on each of 8 drawers, and the brightest color displayed is (255, 255, 50) (that is, red and green fully on, and blue fairly dim). With all 56 LEDs displaying that color, the system draws 2.096A at 5V, so in fact a 10A power supply is significantly oversized. 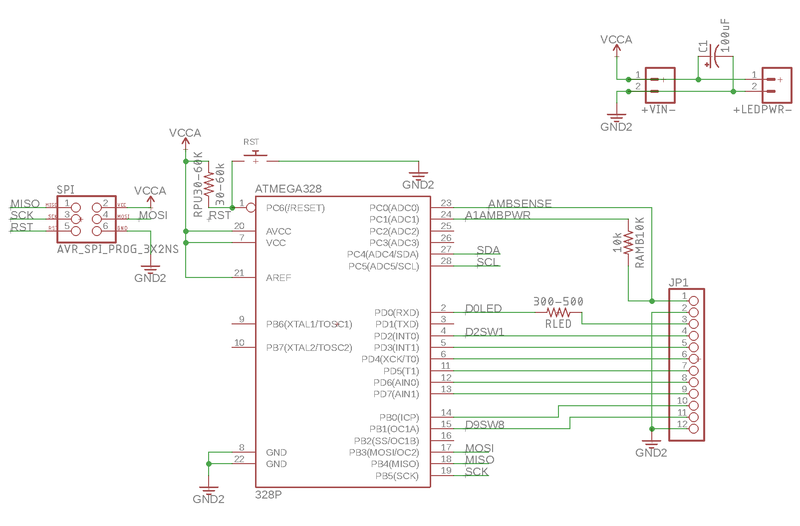 I uploaded the Arduino sketch to the ATMega328 using Sparkfun's Tiny AVR programmer; more notes. Created by and © 2019 Mark Fickett except where noted. I try for valid XHTML 1.0 Strict and CSS.